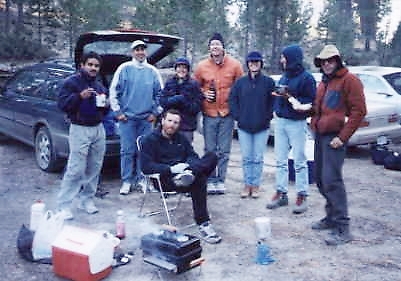 Bob Suzuki was supposed to lead this trip, but had some trouble with a tendon and "handed off" to me just before my Mineral King to Mountain Home trip started. Each time I heard from Bob, there were fewer and fewer participants ... which is odd in light of the fact that the weather reports were great and we once had over 15 people signed up. though they had not canceled. Thanks. So I dayhiked Moses on Friday after having a nice pasta dinner by a campfire at Mountain Home. What a surprise to find really BIG Sequoia trees this far south! There is no big trick to the route: Start at Shake Camp, where the trailhead is in the parking area just east of the campground instead of where the maps show it. Walk at high speed for one hour to where the trail crosses the Tule River, and take a compass bearing for Moses from the map. Walk that way until you hit a large gully that looks like you can climb it. If it looks slabby and horrible, you went too far south. Don't go too far north, however, or you'll have a tedious ridge traverse. You might have a bit of easy third class along the way, but not much. The rock in the right gully is excellent, the rock in the wrong gully is covered with brush. I was back at the car for lunch. There is also a trail up the east side of the Tule (which is not on any map) but it starts hundreds of feet lower and it takes longer to drive to that trailhead. Friday afternoon I flew over to Big Meadow (off the Sherman Pass Road). If you're into mountain roads, this is the route for you. Just try to go when no one will slow you down! Good fun drifting through piles of leaves and needles in gusty wind and bright fall colors. Big Meadow is a fenced cow pasture. Bummer. There are nice places to camp (no campground) at the Sirretta trailhead and between the two Manter Meadow trailheads (where we stayed). Aside from tooting my whistle to get the attention of some hunters shooting from the parking lot, we had a pretty quiet weekend to ourselves. "Quiet" does not count Saturday's happy hour with acid jazz booming out the back of the car! Saturday morning we scooted up Taylor Dome in less than two hours. The SPS list rates this as Class 2, but I question that. We all used our hands, even with some scouting around for the easy way. There is a register just west of the twin summits, down low, from where you can traverse around to the north side to reach the easiest way up. The real register is on top, and indicates that the "official" name is "Miranda Dome" (vs. the name on the SPS list). After a leisurely lunch at the cars, we headed for Sirretta from the north end of Big Meadow. This trail is made of buried cinder blocks for a ways, apparently to minimize the damage done by horses and (legal) motorcycle use. It gets sandy higher up, but the tire tracks continue past the point we turned off to cross-country to the peak. No tricks here, except that the peak (with a BM and the register) is 9977' whereas a bump north of that is 9980' according to the 7.5' topo. Not to worry, someone drug mortar up there and built a 3.5' cairn on the summit, making it 6 inches taller than the other bump. Nights were running about 20 degrees so when I rousted everyone at 5:30am there was much grumbling. Some have even invented stories that I said the sun was up, but they must have been blinded by the Coleman lantern! We hit the trail for Rockhouse at first light (6:30am) with a brisk pace to ward off the cold. Coming from the west, the trail is uphill, then downhill to Manter Meadow, then a LOT downhill before it turns up to the saddle between Rockhouse Peak and White Dome. 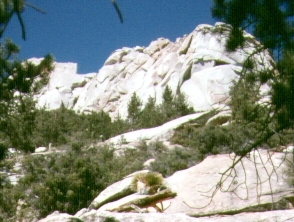 We cut off the trail before the saddle, intending to climb from between Rockhouse's twin peaks. That route goes as class 3 with maybe one class 4 move, but we had several people on their first peak climb so we went around to the friction ramp on the east side. Lots of brush and some yucca between the trail and the peak, but the summit is stunning! This is the best view I've seen of the Domelands. Back at the cars by 4pm, we wasted some serious time on a restaurant along the Kern before heading home via Bakersfield. Participants were Steve Eckert (leader), Alan Duvall, Nancy Fitzsimmons, Maggie Hudson, Ron Karpel, Rich Leiker, Arun Mahajan, Landa Robillard, and Jeff West. A very enjoyable crowd.